HARGEISA, Somaliland — Follow an unmarked dirt road to a dry riverbed in the scrubby, northwestern Somali plains and in the shadows, beneath the sandstone outcroppings, are remarkably well-preserved paintings. They date back between five and 11,000 years and cover the rock walls in streaks of white and black and barbeque sauce red. White stripes highlight a warrior’s clothing, the point of his spear and the curve of an ancient cow’s udder. This is Somaliland’s Laas Geel. 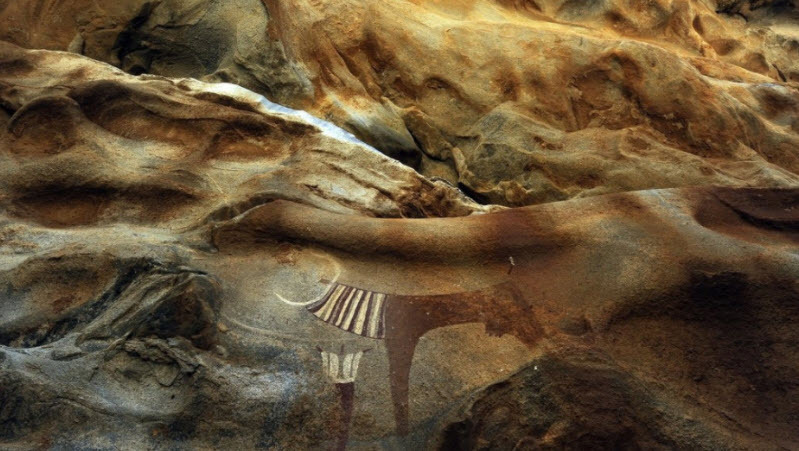 Anywhere else in the world such cave paintings would undoubtedly be a UNESCO World Heritage Site, but here — in the unstable Horn of Africa — it’s in danger of being swallowed up by decades of war, political unrest, drought, poverty and neglect in a region that most of the Western world has left for dead. And that’s where Sada Mire, a young London-educated Somali archeologist, enters the scene. As the only Somali archeologist working on the ground in greater Somalia, and one of only a handful of academics worldwide focusing on the region, she is trying to almost single-handedly identify and protect what’s left of Somali heritage. And she’s doing it without adequate funding, resources or a qualified staff. Although Mire is originally from Mogadishu, the young archeologist now heads up the Department of Antiquities for the unrecognized republic of Somaliland, a breakaway region in northern Somalia. While visitors to Somaliland are still required to travel with guards armed with AK-47s, the breakaway republic’s de facto government has been able to maintain a relative peace for nearly 17 years, creating a platform from which the preservation of Somali cultural heritage may begin — if it’s not too late. “A whole country’s history is almost gone already,” said Mire, who received her doctorate from the University College London last year. “So much has been destroyed already. Boxes of documents, Bibles, scrolls, coins, swords, knives, traditional art, jewelry, beads — all of it is gone forever.” The entirety of the former Somali National Museum in Mogadishu was looted in the period before 1979, and no museums or archival spaces exist today, she said.